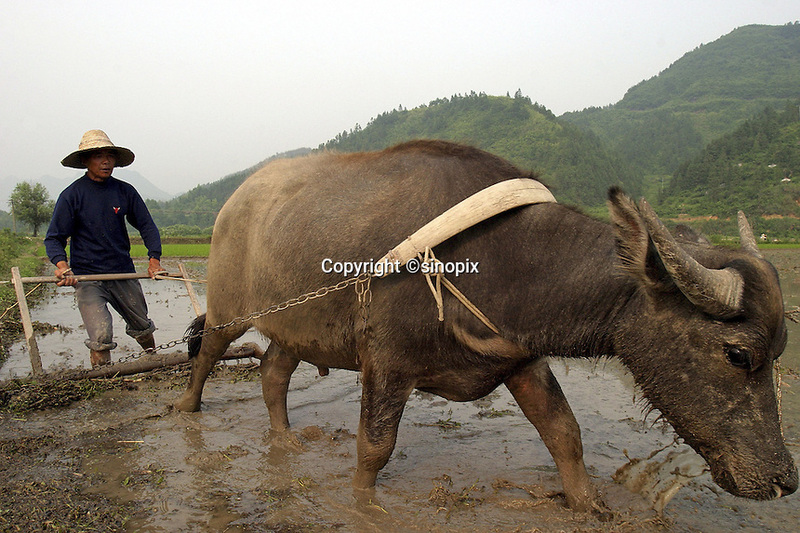 A Chinese farmer working for a local agriculture research team manning a ox-pulled plow for planting rice in a flooded paddy in rural Anhui Province, China. This particular experimental strain is planted weeks after the traditional planting dates. With food production facing pressures from its huge population, Chinese researchers continuosly lead the quest for discovering and breeding new trains in hopes of increasing production and nutrition content. With over 800 million peasants, small scale agriculture is still an unreplacable way of earning income in China despite recent economic booms and labor migration toward cities and non-agricultural sectors.